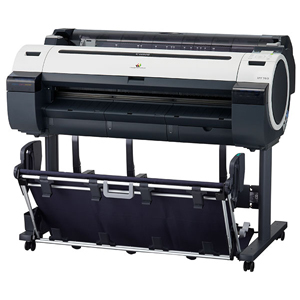 These 36″ large format printers provide the capability to neatly stack up to twenty, 24″ x 36″ plain paper prints. The stacking option can be enabled or disabled, depending on user preference. An increased hard drive capacity on the Canon iPF765 printer streamlines the printing workflow by bearing the processing workload on the printer to help increase overall print processing times. A new interface lock system enhances the security functions on the printer. This feature provides an option for administrative control to restrict usage to the printer. The Canon iPF765 printer is equipped with a disk erase feature that erases print jobs from the printer’s hard disk. This meets the highest level of erasure for disk media as per the U.S. Department of Defense requirements (DoD5220.22-M). This feature completely erases data sent to the hard drive. A number of important built-in features help minimize ink consumption, media waste, and maintenance costs to significantly reduce total cost of operation. These features include Economy Print Mode for lower cost per print, auto-rotation and nesting to minimize media waste, and Canon’s proprietary durable print-head that helps reduce maintenance costs. Canon has also earned ENERGY STAR® certification for the imagePROGRAF printers, drawing only 140 watts of power during use to help keep the total cost of operation at a minimum. Don't buy Canon iPF760 / iPF765 without contacting Napco. Call us today at 1-866-752-6766.